All cooking and no socialising makes LondonEats a very dull person indeed. So today we present the first “on location” post from LondonEats! Rather than a full-on food review, I’m going to ease myself into covering unfamiliar territory by starting with a friendly local coffee house. While the coffee chains might appear to reign supreme in London, there is a healthy independent scene. Cue Tina, We Salute You in up-and-coming Dalston. This area was hailed as “the coolest place in Britain” by Vogue Italia, but take that with a pinch of salt – there are hipsters in abundance here, but it still has more “grit” than your average fashionista is probably comfortable dealing with. Anyway, wrapped up for the cold and leaving my valuables at home, I headed out. It’s a fun little place, black and white decor with colourful, glitter decoupage on the walls. 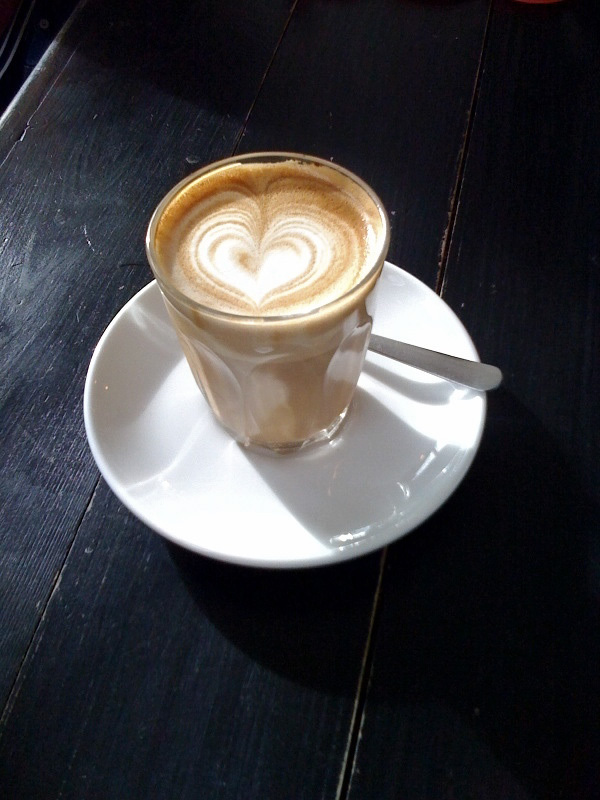 Coffee is great (good, strong, pronounced flavour which can be a relief after weeks of Starbucks) and the food it good. Just a simply bagel with melted cheddar was a great snack, so a big thumbs up that they are doing the basics well. There is also a selection of jams and various other goodies on the table to slather on your toast if you dig the communal vibe. This is a chilled, friendly neighbourhood coffee place and a welcome addition to Dalston. The tube will be arriving in a couple of months, so it will be interesting to see how it changes and whether Tina will adapt. In the meantime, I’m quite happy to salute.